Will, you are sadly missed and lovingly remembered by your mom, dad, sister, grandmother, family, friends and your brother and sisters in blue. Our hearts are heavy but we have so many precious memories of you. Your smile, your laugh, your big loving heart, and your giving spirit is continuing to amaze us all. Brianna, Holly and Charles are so thankful for you being their hero, changing and saving their lives through organ donation. Rest in peace, we'll take the watch from here. Your fingerprints are etched upon our hearts forever! Our Hero lives forever...we will see you in Heaven. May the Lord be with and and your family at this difficult time !!! I met your parents and sister in Gulf Shores, Alabama tonight. Saw their truck...which I found out was yours....noticed the memorial sticker on the back window. I went up and introduced my self. We are all family!!!!! Our hearts break for each other. God bless your family!!! God Bless you Officer McGary. May the good Lord above cradle you in His arms, and may you Rest in Peace my Brother in Blue. I offer my prayers and sympathies to each and every one of your family members, friends, and co-workers. Rest easy Sir. My deepest condolences to the family, members of the department, and those served, at the loss of this officer. May faith, family, friends and time join together to ease everyone’s pain at this time of loss. Thank you for your service, your convictions and moral character, as well as your devotion to duty. May you now rest in peace, knowing your fellow brothers and sisters will watch over your family and continue the Watch! Lord, I sure do miss my friend. I thank you Lord,for the blessing of knowing Will. I had the honor of being his FTO. You were so darn smart and funny. My heart still hurts from you leaving us for heaven. I know you saved many people by donating your organs and you are a true hero! I will see you again and this is not good bye. Though I never knew him, he was part of my Law Enforcement family and I will mourn this deep loss the rest of my life. My heart aches with all the losses we have suffered, and continue to suffer, through the years. God is our only peace through such times & He will judge the guilty. May family & friends feel the presence of the "God of All Comfort" as they endure the distressing days ahead. I join them in their agonizing grief & remember them in my prayers. To help us find relief. Which continues to seal our fate. That now with God you go. Who also met such fate. Brother in Blue, we walk the blue line to protect, to serve others before ourselves to weed out the wrong to make right. You will never be forgotten rest in peace Brother. My personal condolences to the family members of Officer McGary, and also to his co-workers at the Conway Police Department. I pray that Officer McGary's family members are doing well as they struggle with this awful incident. My message to Officer McGary's family is actually a factual comment, and that is Officer William Michael McGary will never ever be forgotten. 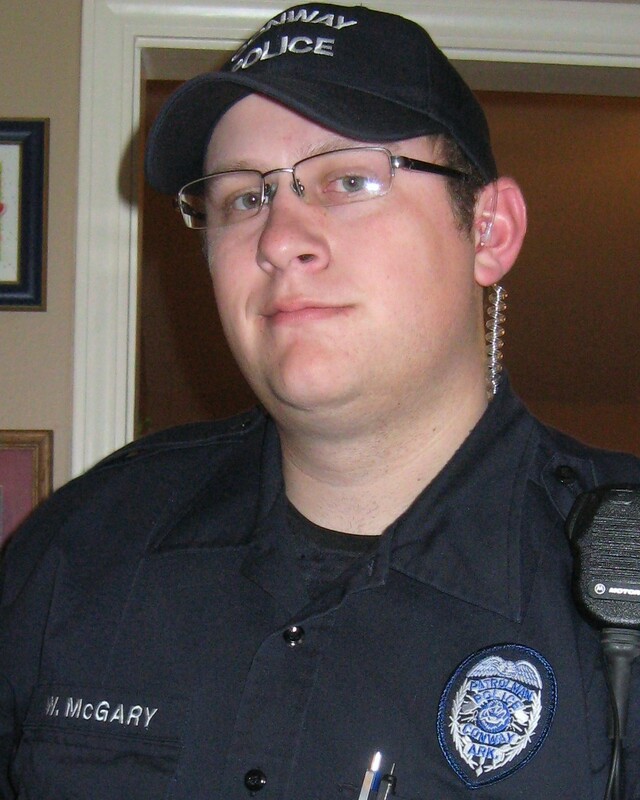 Officer McGary is now with our Lord God as he did his job well here on earth. May God bless his family. I am a retired AR State Trooper and I regret the loss of a fine young man who gave his life for you, the people of Conway. God will bless him dearly! I wanna be just like you one day...!